Ultra Fine Flair: Happy Birthday :-)! 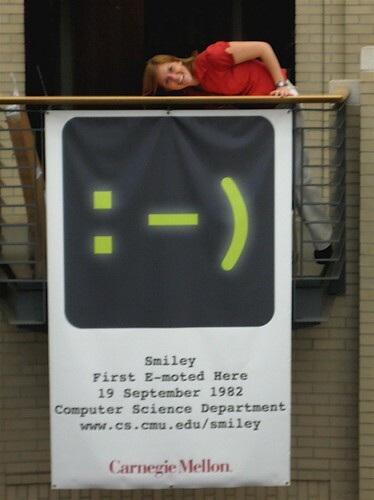 Today be the Smiley's 25th birthday! Arr! * I was lucky enough to visit its birthplace yesterday. The eternal question: Nose or no nose? *It's also, apparently, Talk Like a Pirate day, as evidenced by the pirate flag on Flickr's logo. Who thinks of these things? oh I'll tell you. The guy who invented talk like a pirate day was on wife swap with his fam (and obviously his wife). dude quit his job, dresses like a pirate 24/7 and won't let anyone clean the house because chaos is good. it's also my birthday. could you imagine being born on a more illustrious day? god i wish i could spell. oh my gosh they dedicate a day to this?